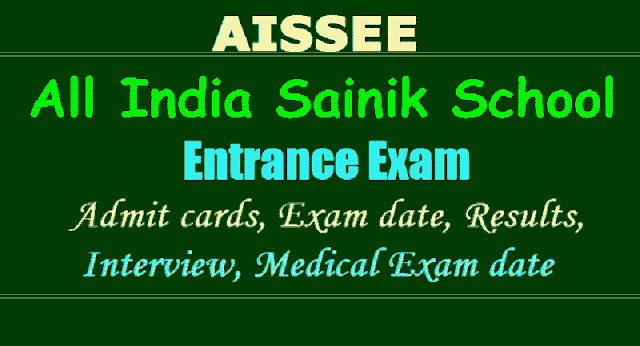 AISSEE All India Sainik School Entrance Exam Admit Cards, Results 2019 - All India Sainik School Entrance Exam Results - AISSEE 2019 (Sainik School Entrance test Results) /Sainik School AISSEE 2019 results declared at sainikschooladmission.in / #SainikSchool #AISSEE Entrance exam 2019 admit cards to release soon at sainikschooladmission.in. Admit card to be released soon for Sainik School AISSEE Exam 2019. Korukonda Sainik School Entrance Exam Admit cards /Hall tickets 2019, Kalikiri Sainik School Entrance Exam Admit cards /Hall tickets. The All India Sainik School Entrance Examination (AISSEE 2019) is likely to release this week on the official website sainikschooladmission.in. The Sainik School Society will conduct a national-level entrance examination on January 6. The exam is held to select students for admission to classes 6 ot 9 in 26 Sainik Schools across the country. దేశ వ్యాప్తంగా ఉన్న‌ సైనిక పాఠశాల‌ల్లో ఆరో త‌ర‌గ‌తి ప్ర‌వేశాల‌కు సైనిక్ స్కూల్ సొసైటీ జ‌న‌వ‌రి 6న ఆల్ ఇండియా సైనిక్ స్కూల్ ఎంట్ర‌న్స్ నిర్వ‌హించింది. ఈ రాత‌ప‌రీక్ష ప్ర‌శ్న‌పత్రంతో పాటు, నిపుణులు రూపొందించిన 'కీ'ను ఈనాడు అందిస్తున్నది. ఈ 'కీ' అభ్య‌ర్థుల అవ‌గాహ‌న కోసం మాత్ర‌మే. సైనిక్ స్కూల్ సొసైటీ విడుద‌ల చేసే జ‌వాబుల‌ను మాత్ర‌మే అంతిమంగా ప‌రిగ‌ణించాలి. Admit card will likely be live soon on sainikschooladmission.in . Sainik School Korukonda Entrance Exam 2018-2019 Admit cards/Hall tickets download from sainikschooladmission.in: Admit card for Entrance Examination for both in the website sainikschooladmission.in. in candidate’s Login. The Candidate can view/download their Admit Card and Can take a printout of it by entering their Application Form number. In the Admit card the actual date and venue of the Common Entrance Examination will be mentioned. How to download the admit card: Visit the official website, www.sainikschooladmission.in; On the homepage, click on the relevant link to download the admit cards; Enter the necessary details like registration number etc. ; Click on submit button; Your admit card will be displayed on the screen; Download and take a printout of the admit card. Admit card was Live on 12-12-2018. Candidates can login to their user account and download Admit Card. Step 5: Your admit card is displayed on the screen. Sainik School admit cards, Sainik School Hall tickets, Sainik School Exam admit cards, Sainik School Hall tickets, Korukonda Sainik School Entrance Exam Admit cards /Hall tickets 2019, Kalikiri Sainik School Entrance Exam Admit cards /Hall tickets. The Entrance Examination will be held for admission to class VI & IX. Boys who are between the age of 10 to 12 years and 13 to 15 years respectively on 31st March of the year in whichadmission is sought are eligible to take the Entrance Examination. For admission to Class IX, the boys should be studying in Class VIII in a recognized school. Admission will be made strictly in order of merit only in classes VI and IX. The written Entrance Examination will be held on 06th January, 2019 from 10.00 onwards. Detailed programme will be intimated by the conducting Schools. Due to change in format total number of questions in class VI as well as IX may change. In the entrance examination, boys who are between the age of 10 to 11 years and 13 to 14 year are eligible to sit. For admission to class 9, the boys should be studying in class 8 in a recognised school. The All India Sainik School Entrance Examination (AISSEE 2019) will release the admit card this week on the official website sainikschooladmission.in. On January 7, the Sainik School Society is likely to conduct a nation-wide entrance exam to select students from class 6 to 9 in 26 Sainik Schools across the country. The All India Sainik School Entrance Examination (AISSEE 2019) results are released on the official website sainikschooladmission.in on February 7 midnight. The Sainik School Society had conducted a national-level entrance examination on January 7. The exam was held to select students for admission to classes 6 ot 9 in 26 Sainik Schools across the country. As per the schedule released by the exam conducting authority, interview and medical exam for the admission will be held from February 18, 2019 to March 10, 2019. The Sainik School will release the final merit list including the waiting list on March 19, 2019. Exam pattern: The exam for class 6 was held in English and Hindi. The question papers for class 9 was set in English only and students are required to answer in English. Sainik School results 2019, here’s how to download: Step 1: Visit the official website, Step 2: On the homepage, click on the result link flashing towards the left hand side of the page, Step 3: Enter the necessary details like registration number etc., Step 4: Click on submit button.,Step 5: Your result will be displayed on the screen., Step 6: Download and take a printout of the admit card. As per the Sainik School Admissions 2019 schedule the Interviews and Medical Test are scheduled to be conducted from 19th February to 10th March 2019, and the final merit list (including the waiting list) will be published on 19th March 2019. Admissions to Sainik Schools across the country will be made stringently according to the merit list only.